Thomas Fox (Williamson) is hired by the wealthy John “J.T.” Thomas (Connelly - yes, there are two characters named Thomas in this movie) to find his missing daughter. Fox, who normally doesn’t do this kind of thing, accepts the job. He gets a lead that she’s in France, so he heads to Cannes just as the film festival is going on. After a bunch of twists and turns, he ends up in Italy, where he gets help from Marianna (Palme) and Josie (Sebastian). After yet more twists and turns, he ends up back in L.A. and must face the reality of the situation he was put into. Will Fox escape this particular trap? Foxtrap is Fred doing what he does best - being cool and busting heads. If you’re familiar with his 80’s output such as The Messenger, this is very much in the same vein, style-wise. If you’re not familiar, it’s a very basic plot where Fred can get into fights, woo the ladies and smoke a cigar amongst a lot of very picturesque locations. The Cannes scenes are especially interesting, as posters for Invasion USA (1985), Death Wish 3 (1985), Power (1986), Witness (1985), Cocoon (1985), Mishima (1985) and The Toxic Avenger (1986), among others, are seen. As the movie states, Thomas Fox is “The Best”, and Fred has never looked better, what with his dapper white suit and all. His license plate even reads “DA FOX”. He gets plenty of great lines, and while there is a certain dumbness in the air (especially during the fight/chase scenes), there’s a lot to enjoy about Foxtrap. It has some of our favorite recurring themes, such as middle-aged punks and fruit carts. Not to mention the time-honored final warehouse fight and the classic sax on the soundtrack. 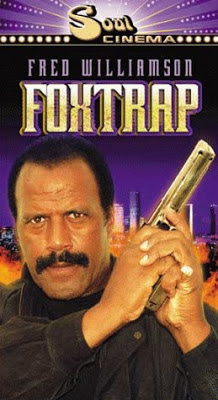 And Foxtrap is noteworthy for being one of the few movies we’ve seen (following American Kickboxer 2, 1993 and Last Flight To Hell, 1990) with a misspelling in the opening credits. “Produced An Story By Fred Williamson”, so it says. 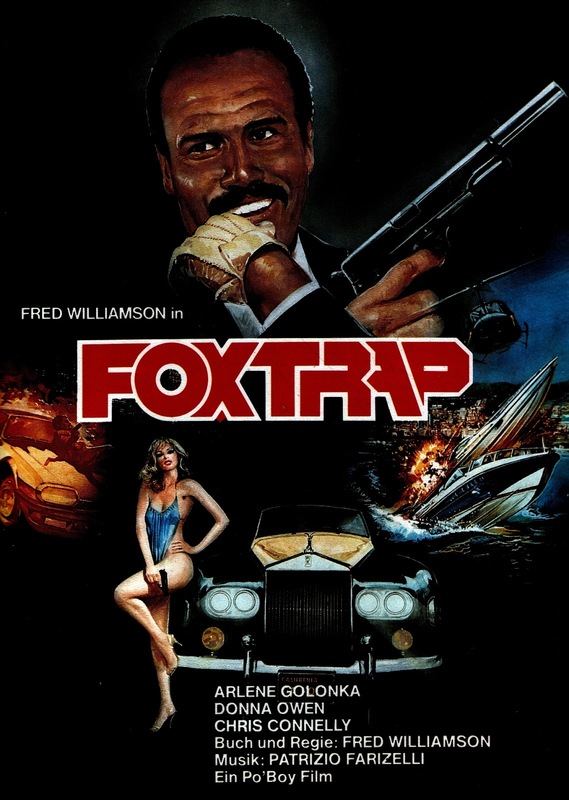 Foxtrap has what you want in a movie like this, so it’s a must for Fred fans, and everyone else should check it out too. I've not seen this one, but it sounds great. Got to love the spelling errors in the opening credits. I can't wait for more Fred reviews! It is solid Fred. Have a feeling you will enjoy it. Thanks! The month has just started and we got some good ones coming up. How strange! I just watched this movie on Sunday for the first time in over 20 years, and then you posted your review the next day. Imagine being at Cannes in 1985, watching Invasion U.S.A. and Death Wish III on the big screen in the same cinema, then walking outside to see Fred filming Foxtrap. Mind-boggling! Foxtrap reminded me of Charles Bronson's 80s movies like The Evil That Men Do and Kinjite in both cinematography and action, mostly minor scuffles. My VHS ends with Coming soon: The Fox and The Cobra. So where's the sequel? We've been waiting for a long time! That is very strange! What a coincidence. That would have been a mind-blowing day. Would love to see the sequel. It's not too late!